I first heard about him in 2006, when his portrait Adele Bloch-Bauer I registered the highest reported price ever paid for a painting up to that point. Since then he has become my favourite painter, and I’ve seen (luckily) some of his magnificent works in Vienna, New York and London. In this post, I have compiled the main locations of his paintings plus some tours available in Vienna. It is easier to group the paintings by museum/gallery. 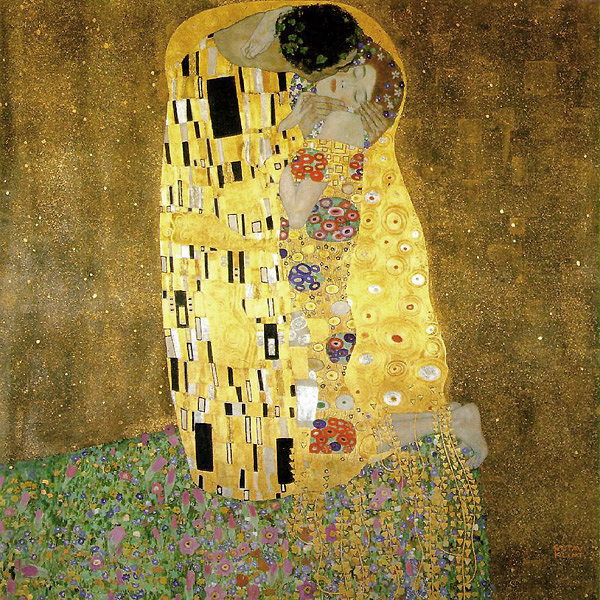 Most of his works are in Vienna, being The Belvedere Palace the place that exhibits the most, including the world famous The Kiss. The Belvedere palaces were the summer residence of Prince Eugene of Savoy (Archduchy of Austria), and today houses the greatest collection of Austrian art dating from the Middle Ages to the present day, complemented by the works of international artists. This includes the world’s largest collection of Gustav Klimt’s paintings, which lies at the Upper Belvedere, and contains The Kiss (1908/09) and Judith (1901). It contains 24 works ranging from his portraits to his landscapes and golden phase, and also his sketchbooks. The Kiss is the gallery’s big star, with guards looking after people who want to take pictures, which are not allowed. The artwork is huge (180 cm × 180 cm) and impressive. It has a black background, which I supposed contains all kind of security measures. So if you want a picture, there is a poster at the entrance. Leopold opened in 2001 and houses more than 5,000 works of modern Austrian art, including the world’s largest Egon Schiele collection. It is located in the popular area of Museums Quartier in Vienna. The core of the collection consists of Austrian art of the first half of the 20th century, including key paintings and drawings by Egon Schiele and Gustav Klimt, showing the gradual transformation from the Wiener Secession, the Art Nouveau movement to Expressionism. The Secession Building (Wiener Secessionsgebäude) is an exhibition hall built in 1897 by Joseph Maria Olbrich as an architectural manifesto for the Vienna Secession. The Vienna Secession (also known as the Union of Austrian Artists, or Vereinigung Bildender Künstler Österreichs) was an art movement formed in 1897 by a group of Austrian artists who had resigned from the Association of Austrian Artists, housed in the Vienna Künstlerhaus. This movement included painters, sculptors, and architects. The motto of movement is written above the entrance of the pavilion: “To every age its art, to every art its freedom” (German: Der Zeit ihre Kunst. Der Kunst ihre Freiheit). It houses the popular Beethoven Frieze, which is 34 meters in length and was intended to celebrate Beethoven’s 9th Symphony. The Kunsthistorisches Museum (also referred as Museum of Art History or Museum of Fine Arts) is located in an impressive palace which was built between 1871 and 1891. It is considered one of the five most significant fine art museums in the world, hosting collections of Egyptian, Greek, and Roman Antiquities, as well as imperia armoury, historical instruments and coins. The building is rectangular in shape and topped with a dome that is 60 meters high. The inside of the building is lavishly decorated with marble, stucco ornamentations, gold-leaf, and paintings. Klimt works can be seen on the museum’s stairwell, between arches and columns, as shown in the picture above (11 out of 40 paintings were created by him). Another work in this museum is called Lady with a purple scarf (Dame Mit Lila Schal). The Burgtheater is the Austrian National Theatre in Vienna and one of the most important German language theatres in the world. It was originally opened in 1741, then largely destroyed during WWII and finally restored in between 1953 and 1955. Klimt created a number of paintings with his brother Ernst and Franz Matsch in the context of the Künstler-Compagnie (a studio collective) they had set up. 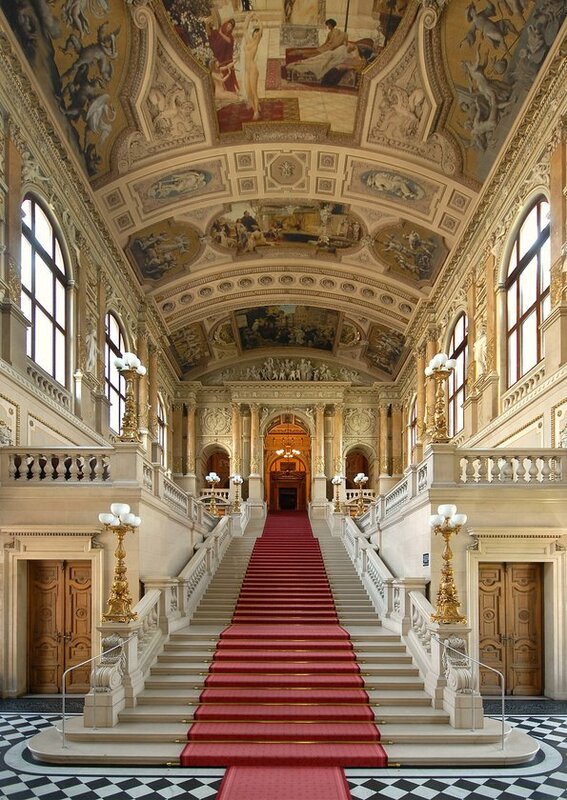 Among these early works are the ceiling paintings created in 1887 for the Burgtheater’s grand staircases, and they already point towards the symbolistic phase of the fin-de-siècle in Vienna [burgtheater.at]. Additionally, a bundle of full-scale sketches for the ceiling paintings were found in the attic of the Burgtheater. 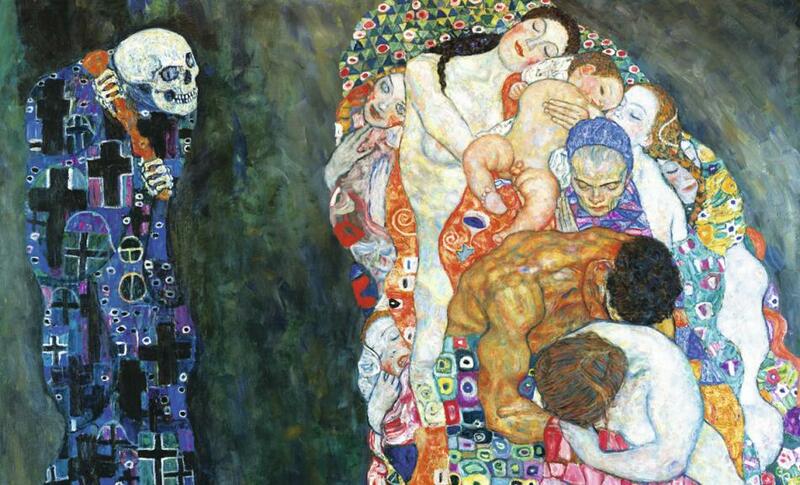 These paintings are seminal pieces in Klimt’s early work, and they also include his only self-portrait. The sketches are now accessible to the interested public in a permanent exhibition at a dedicated Klimt-Raum in the Burgtheater. Neue Galerie is a museum of early twentieth-century German and Austrian art and design located in the former William Starr Miller House, a Louis XIII/Beaux-Arts structure located on the corner of Fifth Avenue and 86th Street. Established in 2001, it is one of the most recent additions to New York City’s famed Museum Mile. In addition to its gallery spaces, the museum also contains a bookstore, design shop, and two Viennese cafés, “Café Sabarsky” and “Café Fledermaus“. The Galerie also hosts the poster for the first Vienna Secession, a silver print of himself on a boat, another print of Emilie Floge, and a number of valuable sketches, including a couple of the Portrait of Adele Bloch-Bauer. The Vienna Museum (Wien Museum or Museen der Stadt Wien) is a group of museums consisting of the museums of the history of the city. In addition to the main building in Karlsplatz and the Hermesvilla, the group includes numerous specialised museums (Otto Wagner Pavilion and Hofpavillon, Prater Museum, Clock Museum and Fashion collection library), musicians’ residences (Mozart, Beethoven and Strauss residences, Eroica and Pasqualati houses, and Schubert birthplace and death place) and archaeological excavations (Michaelerplatz excavations,Vergilius Chapel, Museum and ruins of the Romans, and Neidhart frescoes). 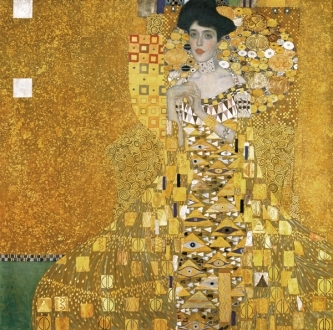 The main building houses two of Klimt’s masterpieces, Portrait of Emilie Flöge (picture above) and Pallas Athene, as well as 400 of his hand-drawings. Emilie Louise Flöge was an Austrian designer, fashion designer and businesswoman. She was the life companion of the painter Gustav Klimt. Two Girls with an Oleander. Wadsworth Atheneum Museum of Art, Hartford, US. The Three Ages of Woman. Galleria Nazionale d’Arte Moderna e Comtemporanea, Rome, Italy. Portrait of Hermine Gallia, 1904. National Gallery, London, UK. Hope II. Museum of Modern Art, New York City, US. Mäda Gertrude Primavesi. Metropolitan Museum of Art, New York City, US. Judith II (Salome). Cà Pesaro Galleria Internazionale d’Arte Moderna, Musei Civici Veneziani, Venice, Italy. The Virgins. National Gallery, Prague, Czech Republic. Teenage Girl. Galleria Ricci Oddi, Piacenza, Italy. Baby. National Gallery of Art, Washington, US. Nuda Veritas. Österreichisches Theatermuseum, Vienna, Austria. Friederike Maria Beer. Museum of Art, Tel Aviv, Israel. Portrait of Eugenia Primavesi. Toyota Municipal Museum of Art, Toyota, Japan. There are many other works that are privately owned and no available for visitors. Among them, I would like to highlight Stoclet Fries, which is shown in the picture above. 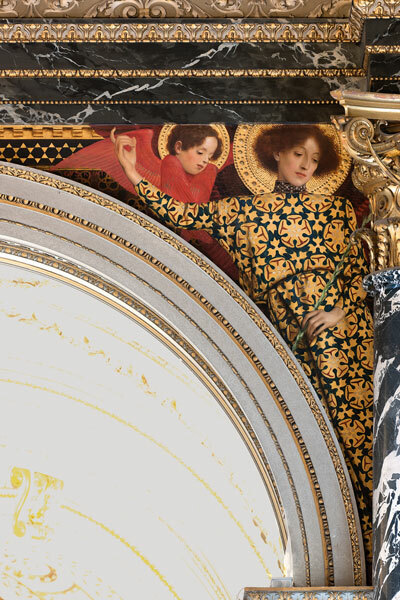 The Stoclet Frieze is a series of three mosaics created by Klimt for the Palais Stoclet in Brussels. The panels depict swirling Tree of life, a standing female figure and an embracing couple. 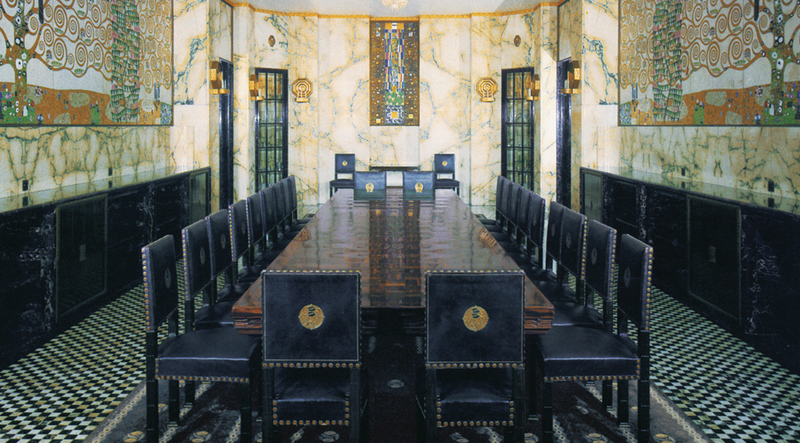 The panels were placed along three walls of the Palace’s dining room. Find below a map containing all the places mentioned in this post, with an image on each of them. Find below some tours about Klimt in Vienna, from the simple “skip the line” of the main museums to some others with guides and extras. You can buy them online following the links next to the titles. For more information about Vienna, please visit our post “What to do in Vienna: hotels, attractions and restaurants“. The following list is a selection of works about artists, containing his paintings, history, critics and more.